Aaliyah Medina completed 22 of 34 passes for 390 yards and six touchdowns on Tuesday to lead the Mountain Lions to a 46-25 road win over Durango. Sierra Vista’s Aaliyah Medina completed 22 of 34 passes for 390 yards and six touchdowns on Tuesday to lead the Mountain Lions to a 46-25 road win over Durango. Jamie Kalaau-Sunia caught nine passes for 200 yards and three TDs for Sierra Vista. Brianna Miller, Kylie Peterson and Kayla Sanguinetti each added a touchdown catch for the Mountain Lions. Durango’s Gabriela Corchado caught nine passes for 154 yards and two touchdowns and added a 16-yard TD run. Tatiana Baes had a 77-yard TD catch and rushed for a touchdown, and Nayeli Silva-Kahalewai completed 13 of 17 passes for 300 yards for the Trailblazers. Shadow Ridge 33, Centennial 19 — At Shadow Ridge, Samantha Guerra supplied 14 rushes for 135 yards and three touchdowns, and added nine tackles and an interception on defense, as the Mustangs downed the Bulldogs. Freshman quarterback Mikayla Brown completed 17 of 27 passes for 151 yards and two TDs for Shadow Ridge. Brown set a school record with 38 TD passes this season. 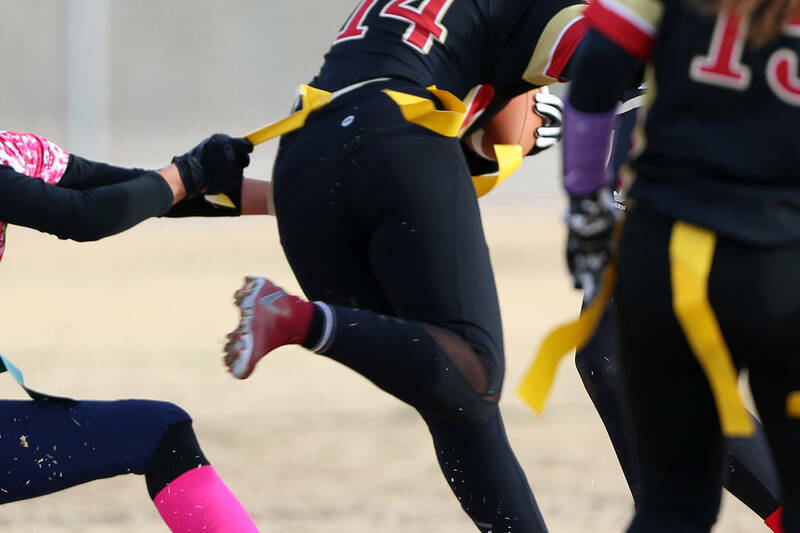 Natalia Rosales added a rushing touchdown for the Mustangs. Cimarron-Memorial 40, Bonanza 27 — At Cimarron, Tiarra Del Rosario threw six touchdown passes as the Spartans beat the Bengals. Del Rosario completed 23 of 35 passes for 303 yards and rushed for 159 yards on 15 carries for Cimarron. Mya’Lia Bethea had seven catches for 105 yards and three TDs, and Natsha Obradovic had six catches for 85 yards and two touchdowns for the Spartans. Dina Lee added seven catches for 83 yards and a score for Cimarron. Cindylou Rasiang completed 25 of 37 passes for 331 yards and three TDs for Bonanza. Shayne Dunn had eight catches for 175 yards and two TDs, and Alicia Kestneer caught eight passes for 72 yards and a score for the Bengals. .
Boulder City 28, Moapa Valley 13 — At Boulder City, Elizabeth Taggard caught three touchdown passes to lead the Eagles over the Pirates. Taggard had 11 catches for 75 yards. Makaela Perkins completed 13 of 22 passes for 102 yards and three TDs, and Ryann Reese rushed for 102 yards and a touchdown on 16 carries for Boulder City. Del Sol 35, Sunrise Mountain 7 — At Del Sol, Janeth Varela caught four touchdown passes as the Dragons defeated the Miners. Varela had six catches for 79 yards. Stephanie Tewart completed 18 of 24 passes for 206 yards and five TDs, and Angel Hdoges added a TD catch for Del Sol. Silverado 31, Clark 6 — At Clark, Katie Mulligan completed 21 of 30 passes for 158 yards and five TDs as the Skyhawks routed the Chargers. Brielen Aquino and Kathleen Fonua each had two TD catches, and Toni Garcia caught a touchdown pass for Silverado. Kennedy Power rushed for 82 yards and a touchdown and intercepted a pass for the Skyhawks. Clark’s Valeria Morquecho caught a TD pass from Jagayra Gomes. Chaparral 32, Mojave 0 — At Chaparral, K.K. Millsap passed for 170 yards and two touchdowns as the Cowboys blanked the Rattlers. Virgin Valley 45, Valley 0 — At Mesquite, Shaylee Feltner rushed for 180 yards and four touchdowns on 16 carries as the Eagles routed the Vikings. Ally Wright threw two TD passes to Mira Larsen, and Nataly Serna-Ramirez returned an interception for a touchdown for Virgin Valley. Desert Oasis 33, Spring Valley 7 — At Spring Valley, Makayla Rickard threw three TD passes and ran for a score as the Diamondbacks defeated the Grizzlies. Rickard completed 13 of 21 passes for 180 yards. Ashlynn Tuss caught a TD pass and rushed for a touchdown, and Jaid Riana Raval had four catches for 75 yards and two TDs for Desert Oasis. Rayahni Peters threw a 40-yard touchdown to Siam Vicuna for Spring Valley’s lone score. Palo Verde 14, Arbor View 6 — At Arbor View, the Panthers defeated the Aggies.